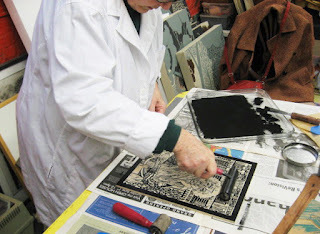 Today was the rescheduled final meeting for the fall series of woodcut classes organized through the BAC. But last night I wasn't sure it was going to happen. Weather forecasts called for some kind of winter weather around the state, including the possibility of snow. But by this morning it had been declared that the snow and freezing temperatures would be staying far to the north, leaving us nothing but a little rain. So I sent out word that we would be meeting. Two of the four couldn't make it (non-weather related reasons), and I'll offer them the opportunity to make up the hours later. The two who were able to come made good use of the time. 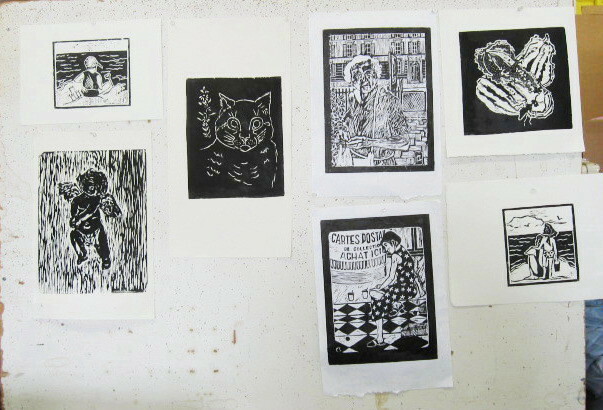 Each brought in a block that had been further cut since being printed last week and pulled new proofs. 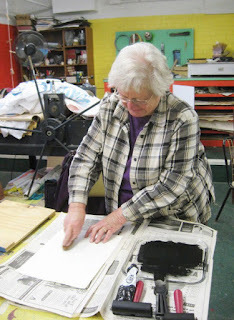 Mary brought in a small newly cut linoleum block, and Joan did more cutting on her cat block and pulled a new print. Both were happy with the updated versions, but have plans to continue working on the blocks in the coming weeks. Above are the proofs of the four blocks printed today. 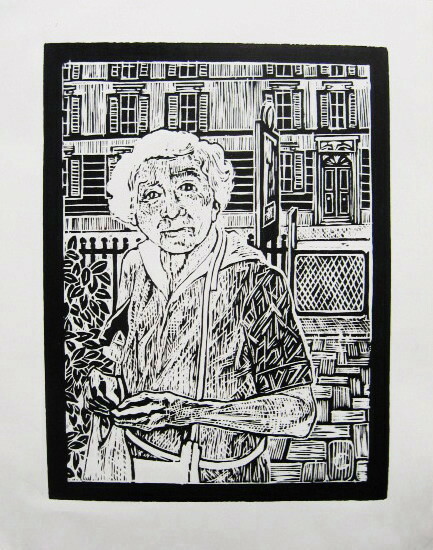 Below is a close up of the second state of Mary's new larger print. At least some of this group is interested in continuing to take woodcut classes, and I expect to set up another series through the BAC in the early spring, assuming that we are back in the Boatworks by then. I'll get the word out once dates are worked out and it's possible to sign up. 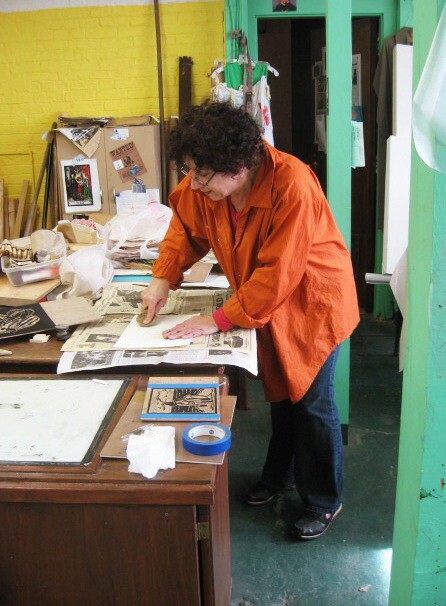 Another recent activity that was affected by the storm was the latest faculty show up at Kean University. When I first started teaching about a decade ago, the full time faculty would have a show in the building's main gallery every year. When I asked if the adjuncts ever had a show, I suddenly found myself in charge of it, and I co-chaired the first two adjunct exhibitions, with gap of a few years in between. Another adjunct took it over for the third edition, but it has been three years since then. Meanwhile, changes in the department have left it with half the full time studio faculty that we used to have, really not enough to fill the space. So the decision was made to invite the adjuncts to be part of the show this time. 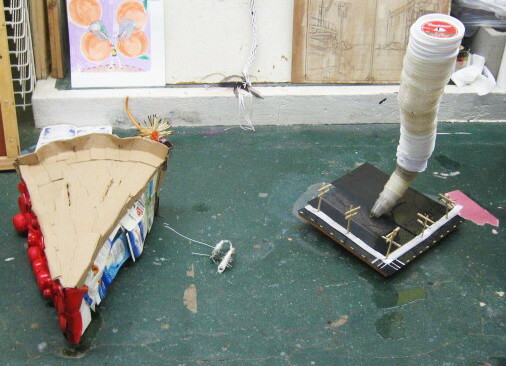 Apparently a lot of the adjuncts missed the e-mail, or didn't get around to replying in time, so I was invited to have two pieces in the show. The intake and installation were delayed a few weeks by school closings, but it's finally up now. I haven't seen it yet, but I received this photo (click it to enlarge) via e-mail of the main room. My two contributions are there on the far right, my boardwalk night time scene, and the cropped version of the smoker print. The Fall Salon: 2012 Fine Arts Faculty Exhibition will be on display in the James Howe Gallery in Vaughn-Eames Hall at Kean University through December 21st. The gallery is open various hours Tuesdays to Fridays, and there will be a reception on Wednesday, December 12th, from 4 to 6 pm. I'll post some more photos from the show on that occasion. For the first time in almost a month (not coincidentally the first time since a few days before Sandy's arrival on our shores), I was able to get into the Studio for a little while and work on some art. That would be the current boardwalk block, my daytime scene set in Asbury. I went back to work where I left off last time, a piece of Convention Hall on the right side of the block. This time it was some of the architectural detail of the large rectilinear section (the theater). Mostly it was playing with the spacing of the vertical dividers between the upper level windows, which also function as columns in a stoa type walkway on the lower level. I don't want to change the overall proportions of the building from what I had, since the space between the two buildings is already smaller than I'd like. By making the first window/bay (just to the left of the main entryway) a little narrower, and adjusting the others to be proportional, I was able to put in 8 where I had only 5 sketched in last time. Technically there should be 10, but I wouldn't be able to cut the details any smaller than this, and only the most obsessive Asbury people would probably realize the inaccuracy anyway. 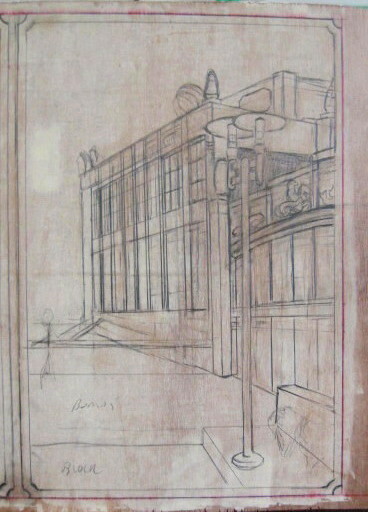 This is why I prefer to make up my own architecture in these prints- as long as it makes sense, it's right. After I was done sketching for the day, I took a walk up toward the beach in Ocean Grove, to see the storm damage and collect some reference material for my planned Sandy boardwalk print. Many of the boardwalks in the region are still off limits to the public, so while I've seen lots of photos in the papers, this was my first in-person look. Walking up Main Avenue, I couldn't see any sign of damage to houses or businesses that I would have to attribute to the storm. (there were a few signs of houses being repaired, but Ocean Grove is in a constant state of renovation, so it could just be that) Finally up at the boardwalk I could see some obvious storm effects. I had heard from Tim (crit group regular and local resident) that the boardwalk was mostly still there, but not so flat and straight as it usually is. Photos above and below show evidence of that. Note the crazy angles of the light posts, reflecting the angles of the boards in each section. I walked north for a while. The Pavilion was still standing and looked fine, and the boardwalk in that area, protected by massive dunes, also looked normal. These photos and others I took should be helpful when I design my own storm damaged boardwalk eventually. My fall class for the Belmar Arts Council has had to take a few weeks off. The planned third meeting was postponed in advance of Sandy's expected arrival, and by the scheduled day for the fourth meeting, the Boatworks had been taken over by the town to use as a disaster relief headquarters. (and this storm was definitely a disaster for Belmar) The decision was made to suspend all BAC functions until such time as we can move back into the building, but that is likely not until next year. I can't do anything about most of what has been displaced, but I do have the means to host my class in a place that is designed for the purpose and just a few miles up the road from where we were. The BAC and the class participants were all open to the idea, so once things in the area got a little more settled, I set it up. Today was the first of the two remaining sessions. At exactly 10:00 am, no one had yet arrived, but the first person showed up about 5 minutes later, and two others appeared in the room before long. (the fourth never showed) After that, it was pretty much like the class would have been if we had it in Belmar. 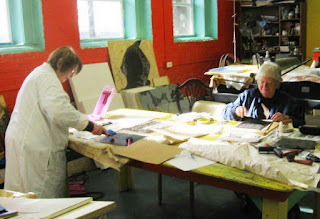 The group did express how much they liked working in the Studio, which thanks to our new windows, is much brighter than the Boatworks. We don't have as many tables as the Boatworks does, but mine are larger and a lot sturdier than the plastic folding tables in Belmar. Still, I had to put my small wooden kids table (a recent arrival here, but in the family as long as I can remember) to use as the paper table. A busy group of printmakers there today. Jill brought in three previously cut and printed blocks, with the goal of getting better proofs than she had previously, and she was happy with the results. Mary brought in two brand new blocks (she found cutting wood blocks a good way to pass the time during her days without power) and took state proofs of each. Joan did some additional cutting to a block she had started last time, and brought in an old block started many years ago, and pulled proofs of both. As each proof was pulled, we put them up on the tack board so we could all get a good look. 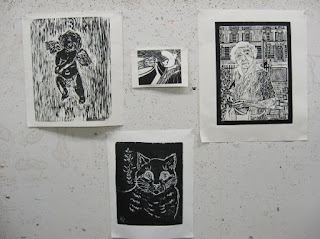 One more session to go and that will be the end of woodcut classes for the year. Sometime in 2013, when things get back to normal, I'll put it back on the schedule and see what happens. It's been a rough few weeks for just about everyone around these parts, but things are finally starting to return to normal. Most schools have re-opened, including mine. Most people have power again. Molly and I discussed whether or not we should hold a critique group this month, and decided that it would be another sign that life was returning to normal. So seven of us gathered there in the basement, and while the storm did have some impact on the art, it was very much like a typical critique. Above is a view of the first wave of artworks. Top row, from left to right: Mary's painting, Harriet's talking stick, my current boardwalk block. Bottom row, Mary's readymade sculpture, Molly's comic book, and Lisa's sculptures. 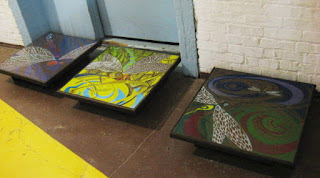 Below is a close-up of Lisa's pieces in progress. There is a large cherry pie slice featuring a crust made of coffee cup sleeves on the left, a miniature tornado made of plastic cup lids on the right, and in the middle two shrimp, but you're better off not knowing what they're made from. 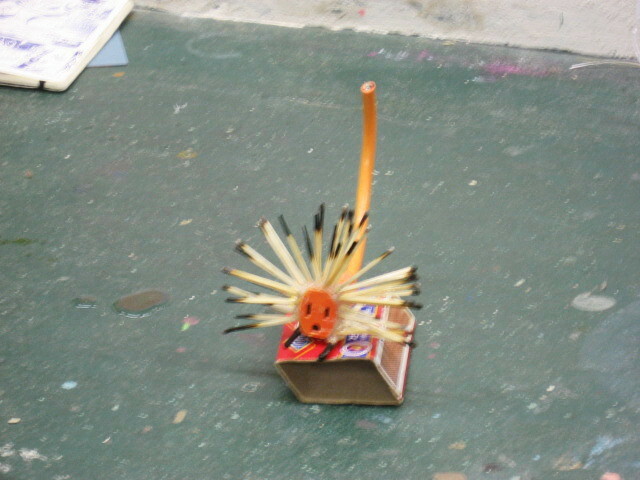 Above, Mary's small readymade sculpture, made from a piece of electrical cord and used wooden matches (used to light the stove during the black out). Is it a lion, an insect, an idol representing sexuality? There were differing opinions tonight. 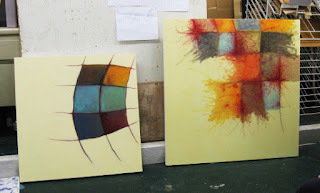 Below, two new paintings from Vince, part of his grid based body of work, destined for an exhibition early next month. Molly showed two things. 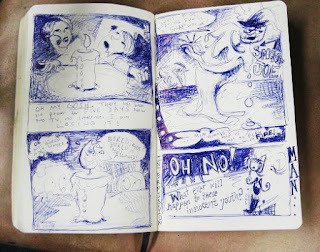 Above is the beginning of a comic book project, something created with her daughters while they were riding out the long power failure, and influenced by that event. Below are some carved and painted tabletops, finally coated with resin and ready to be picked up by the new owners. I showed my current block, the Asbury scene, and briefly talked about the changes I had made in the one session I had to work on it before Sandy shut down my new art for month. Mostly I used it to introduce the idea that I eventually expect there to be a boardwalk print based on the destruction caused by the hurricane. Some liked the idea, while others were concerned that it wouldn't fit in with the rest of the series. It would be a while before I could have time to actually start it, so I have time to think about how it would work. The media had warned that Hurricane Sandy would be one of the worst storms to ever hit New Jersey. In the days leading up to it, the power companies that serve this region of the country warned its customers to expect to lose power for 8 to 10 days, and that was with them prepared for the storm. For me it was indeed 8 days, though some places still are without electricity for 12 days and counting. Areas closest to the water were hit especially hard. 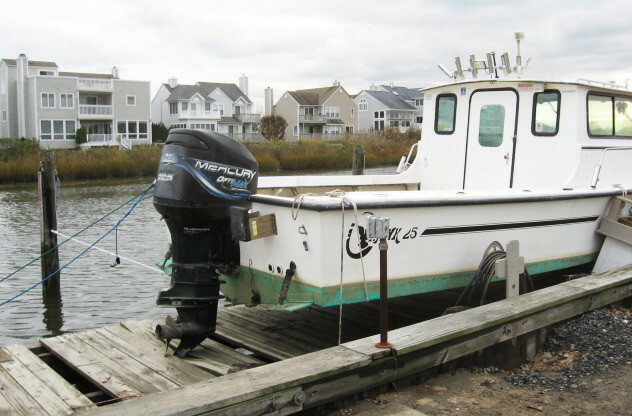 Most boat owners dock their boats in the water, not on top of the dock itself, so that scene above (and countless like it all over the state) was Sandy's work. 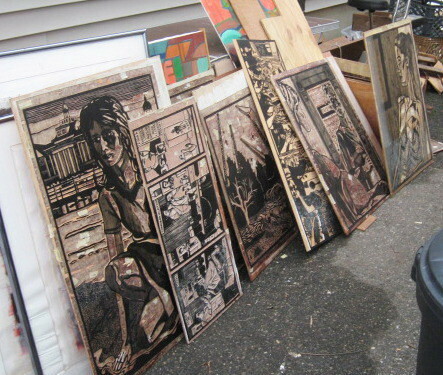 Almost all of my framed artwork survived the storm in a safe building, and that which was in the basement in Manasquan was mostly well above the flood zone. 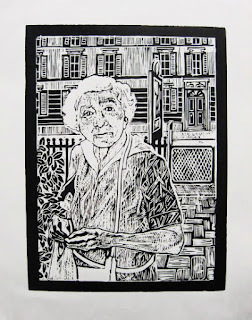 Several framed Ecclesiastes prints were on a lower shelf, but I can always print new copies and cut new mats. Unfortunately, I didn't have enough room on the high surfaces for all the blocks. Many larger blocks (above) were standing in a special holder, raised a foot off the ground, but unfortunately, still a foot below the waterline. Even if I could ignore the sewage related contamination (and I can't), being submerged in clean water is enough to wreck them. Wood swells, warps, cracks. Sometimes the veneer (the printing surface) breaks off from the rest of the block. Smaller blocks were packed in boxes. 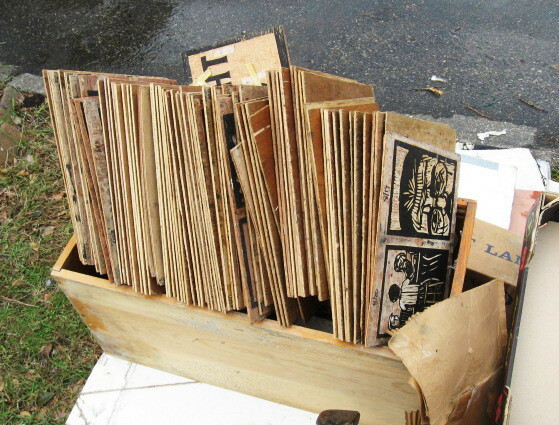 The whole set of 185 Fourth of July blocks was in one very large custom made cardboard box. The blocks toward the top of the box were fine, but those on the bottom were beyond help. So about half of them (below) had to put in the garbage pile. There are about 75 saint prints, and all but the newer ones (and a few that were recently reprinted and still at the Studio) were in one box on the lower shelf. Only a dozen or so near the top of the box survived. I have at least one proof of every print, so if there's a demand for one of the back saints, I guess I'll have to remake the block. On the other hand, all the Ecclesiastes blocks and supermarket blocks were in a box on top of other boxes, and all are safe for the future. The lower shelf also included several cardboard folders, which held assorted loose prints, especially larger prints (like from those big blocks above). All of those folder were partly under water, so all of those prints were lost. In most cases I have at least one proof of each in a frame, or rolled in or on a tube in my closet. But in a few cases I lost the only proofs I had. The only consolation is that these lost prints were lesser images that were unlikely to ever be exhibited again. These folders also included some unused print paper. That can always be replaced, but it's sad to see it go to waste. So Sandy stole a few dozen prints from my inventory, and permanently ruined a few hundred blocks. But I will likely get some things from it as well. Suddenly my current boardwalk based series has a new context. Pretty much all of New Jersey's boardwalks were seriously damaged- the buildings blown open, rides washed away, the boards themselves ripped up. Any time I show any of these prints here in NJ in the near future, viewers can't help but think about the destruction of these popular destinations. And I think this means that I have to do a hurricane related print. Hard to collect my own references right now, since police barricades block access to most beach and boardwalk zones still, with even residents sometimes unable to return to their own homes. Maybe in a few weeks I'll be able to get close enough to take some photos and get some ideas. There may be a supermarket print to come out of this as well. I live across the street from a supermarket that has its own generator, so it reopened as soon as the storm passed. And for a few days, it was the only store of any kind open for miles in all directions, and it was packed with shoppers. No one panicked enough to result in violent confrontations, but people were definitely desperate to get certain items, and some shelves and aisles were completely cleaned out. I'll make some notes and basic sketches, and set them aside for a future time when I don't have a bunch of other prints to do. It's been almost two weeks since I had occasion to post something here, other than updating a posting about Bob Ross that I had started just before my power went out. Part of that is because that power (and thus my home internet connection) stayed off until just a few days ago. The few times I was able to get access at my brother's house I used the limited time online for school business and some direct correspondence with friends. The other part is that I had a major job to deal with, and it's not quite done yet. With the storm approaching I took what precautions I could for my art. Went into the Studio to make sure all my blocks were protected in plastic and up on my table, just in case the surge breached our building. Also protected framed work in my apartment, again wrapped in plastic and moved away from windows. 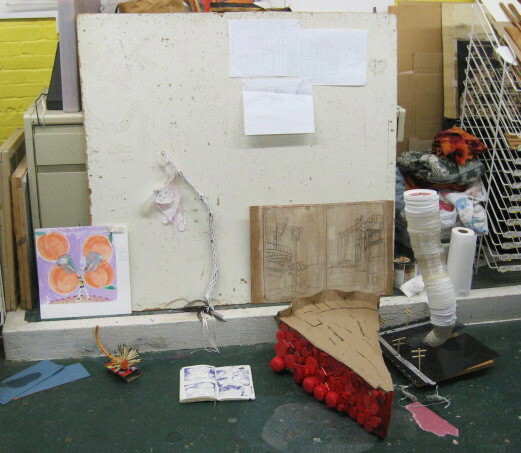 However the largest amount of art and related materials I have is still in my former studio, the basement of the family home in Manasquan. The basement has a history of minor floods under extreme weather conditions, so I had a history of keeping all my art stuff off the floor. Framed work (large individual pieces and shipping boxes of series work) on a high shelf or on my work table, and assorted large prints in folders, along with all the blocks that predate my Ocean Grove space, on shelves at least a foot above the floor, higher than any flooding I'd ever seen there. Last year we had Hurricane Irene come right up the coast, and the house survived just fine- no floods, and only losing power for a few hours. The basement had a lot of other stuff, too. 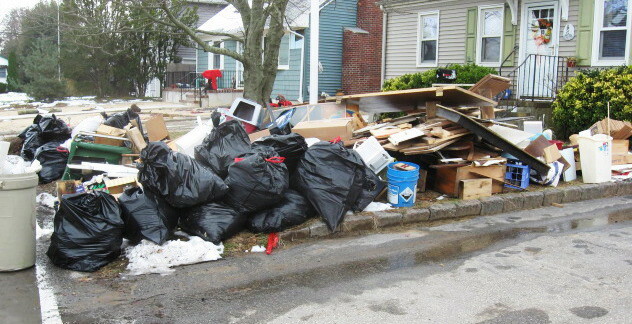 Much of what was emptied out of the house in Bloomfield ended up in the basement, on every other surface, or just in boxes stacked in every bit of spare space. Plus stuff left behind by many other family members who have lived in the house over the years. The basement also included a rudimentary bathroom (toilet, sink, shower stall) that was very popular before a second bathroom was put in on the main floor. This basement facility (particularly that toilet) was known as "Uncle Moe" a reference to a long story of my grandfather's, previous owner of the house. On Monday, October 29th, Hurricane Sandy charged up the Atlantic coast, as predicted, then combined with two other weather systems (from the west and north), and took a hard left right into the New Jersey coastline. Around 2 pm, long before the storm made landfall, my power went out. 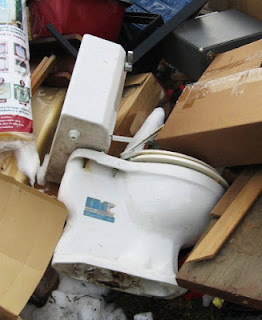 In the early evening I got frantic call from my mother- the storm surge overwhelmed the town's sewer system, and now a mix of sewage and storm water was pouring out of that basement toilet and beginning to fill the basement. And there was nothing anyone could do about it. It eventually rose about 2 feet. The storm absolutely devastated the shore towns. Boardwalks were ripped up, many buildings partly or completely destroyed, trees and power lines down on almost every block. It was a few days before I could even make the three mile trip down to Mansquan to inspect the damage. By then a plumber had removed the useless toilet, so that hole now became a floor drain, and the flooding had settled down to a few inches. Thus began my new job, cleaning out that basement. Along with my father, brother, and sometimes his wife, I spent hours each day down in that mess, hauling our anything solid enough be carried up the stairs, and bagging up everything else. Anything that had been under water was contaminated, and had to go. Most of that time we just had whatever light leaked through the windows, so we had to quit each day by late afternoon. As I said, that basement was pretty full. We removed an old washer and dryer, a couple of refrigerators, and lots of furniture. My hardware store owning grandfather had left behind paints and related chemicals going back decades, along with hundreds of feet of various lumber. All went up the stairs or out the window. Also decades worth of family keepsakes were destroyed. Unfortunately, a significant amount of my art stuff was also under water long enough to be damaged beyond saving, but I'll address that in the next post. By my count, I spent parts of 8 days working down there. I had one day off from the basement this week, when one of my schools actually managed to open for a couple of days. Taught a class and got home just ahead of a snowstorm that knocked out power again to some recently restored areas. The lights finally came on yesterday, just in time for a professional cleaning crew to come in a scrub down the now empty basement. 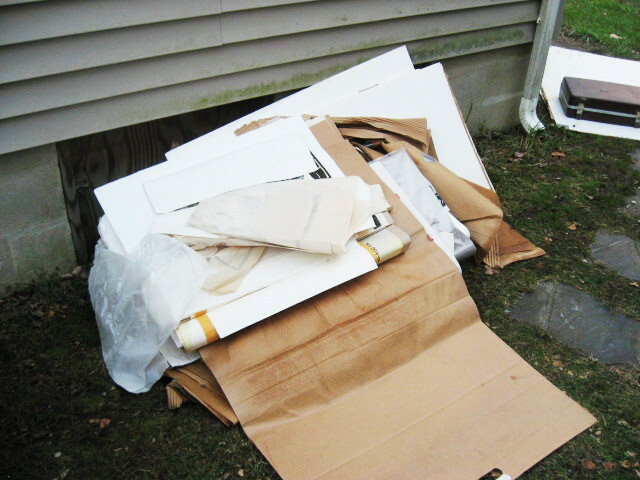 Today I got to spend the day outdoors, reorganizing the junk piles on the front lawn into categories (construction materials, household trash, paints and solvents, saturated cardboard and paper) for eventual pick up by the town. Naturally, my only art related activity this week was dealing with the art I had in the basement. What had survived the flood was secured in place or relocated to my home or the Studio (neither of which had any storm damage). The rest is in piles on the front lawn. I only got electricity back a few days ago myself, so after my days in the basement, I had nights of candles and flashlights back home, so working on woodcuts was out of the question. However, things are slowly returning to normal. Power is on, all my schools are open next week, and it looks like we may even hold our traditional critique group for anyone who can make it. 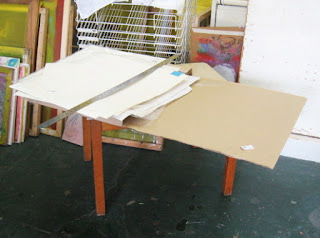 It will be nice to make some art, instead of throwing it away.